Two dogs, with envelopes in their mouths, padded by her side. 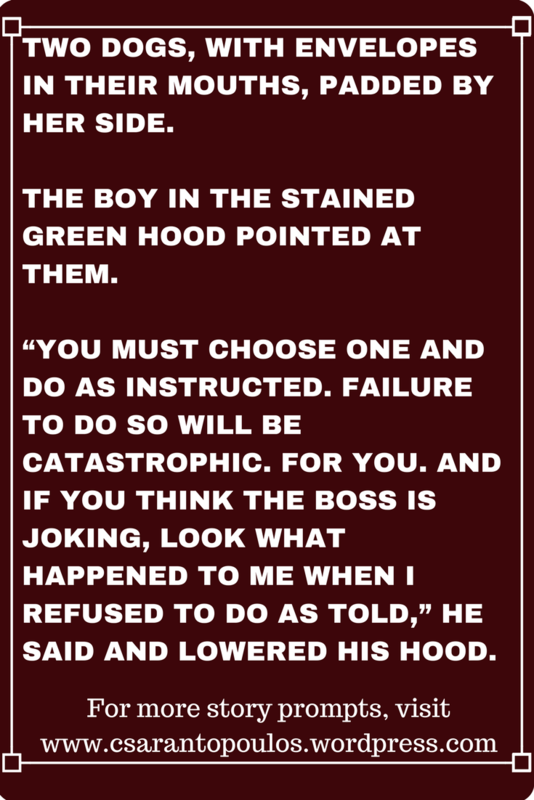 The boy in the stained green hood pointed at them. “You must choose one and do as instructed. Failure to do so will be catastrophic. For you. And if you think the Boss is joking, look what happened to me when I refused to do as told,” he said and lowered his hood. This entry was posted in Inspirational Prompts and tagged creative writing, ideas, inspiration, inspirational prompt, novel. story, prompt, short story, stories, story, writing. Bookmark the permalink.